What is Space Designer 3D? 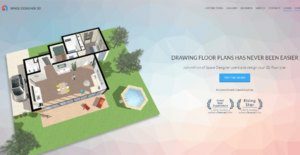 Space Designer 3D is an online design tool that enables users to create floor plans, visualize their designs, and walk through their projects in 3D and in real-time. The application is very intuitive and easy to use, enabling anyone to draw walls in moments without having special skills. Users can range from simple individuals who want to design their own homes to construction professionals such as interior designers, architects, and renovators. Space Designer 3D makes it easy for people to build their own design, from the number of rooms, specific dimensions and measurements, to the colors of the paint and more. With over 1,500 pieces of furniture, you can visualize how everything will look. This preview functionality helps you make better decisions, letting your imagination fly before you commit to renovating your room or building an entire house. Space Designer 3D makes it easy for just about anyone to create floor plans, visualize all the details, and walk through them in 3D without requiring a specific designing skill set. On top of that, you don’t need to download the application to your computer. Space Designer 3D is a web application and functions online, allowing you to access the system and build floor plans and interior designs from just about anywhere. Visualization of your plans is fast, easy, and very realistic. Space Designer 3D comes with over 1,500 pieces of furniture and grants you total control over all the details your design, ensuring that you have the most accurate preview of your design prior to making any big decisions. If you are a business owner selling furniture, Space Designer 3D allows you to include your product into your designs. The system lets you convert your products into high-impact 3D objects and display your designs with your product in it. You can then have the design printed and make it a part of your catalog. Interior designers and professional renovators can use Space Designer 3D to get their clients involved with their projects. Clients can incorporate their ideas and see how they would look like in real life with you assisting them as they progress. As a cloud-based application, Space Designer 3D is accessible from just about anywhere. There is no plugin installation needed and you can design and visualize your plans, or even make presentations using your computer, laptop, smartphone, or tablet. What Problems Will Space Designer 3D Solve? A. Real Estate Marketing: John and Mary want to purchase a home, but despite all the efforts made by David, their realtor, they cannot see themselves live in any house with decorations and furniture style going against their preference. With Space Designer 3D, David enables them to view the house with their furniture so they can have a preview of their lives it. B. Furniture Retailers: Tom works for a wooden furniture company that has introduced a new chair to the market recently. Being in charge of the new products catalog, Tom needs to provide a beautiful image of the new chair for their customers to see and eventually persuade them to make the purchase it. The usual course of action is to hire a professional photographer and have a photo session, which can be quite expensive. What if Emma, Tom’s manager, is not happy with the result? Tom has to do it all again and spend thousands of dollars. With Space Designer 3D, Tom can build his own scene in 3D, and generate a photorealistic rendering within minutes. If Emma doesn’t like it, he just has to press the rendering button again, with no extra cost. C. Event Planning: Kate is planning a wedding for the end of the month and needs to work with 5,000 guests to place! With Space Designer 3D, Kate doesn’t need to spend long, sleepless nights trying to figure out how to make things work. The application allows her to recreate the room in 3D, duplicate the tables and chairs with the Group Selection tool, and add a label to each room to place everyone. She can then send the floor plan to her clients for approval. If you are considering Space Designer 3D it may also be sensible to check out other subcategories of Best Architecture Software collected in our database of SaaS software reviews. Organizations have diverse wants and requirements and no software solution can be ideal in such a condition. It is futile to try to find a perfect out-of-the-box software product that meets all your business requirements. The smart thing to do would be to customize the application for your specific needs, staff member skill levels, finances, and other factors. For these reasons, do not hasten and pay for well-publicized leading applications. Though these may be widely used, they may not be the best fit for your particular wants. Do your groundwork, look into each short-listed application in detail, read a few Space Designer 3D reviews, contact the maker for clarifications, and finally select the product that provides what you need. How Much Does Space Designer 3D Cost? We realize that when you make a decision to buy Architecture Software it’s important not only to see how experts evaluate it in their reviews, but also to find out if the real people and companies that buy it are actually satisfied with the product. That’s why we’ve created our behavior-based Customer Satisfaction Algorithm™ that gathers customer reviews, comments and Space Designer 3D reviews across a wide range of social media sites. The data is then presented in an easy to digest form showing how many people had positive and negative experience with Space Designer 3D. With that information at hand you should be equipped to make an informed buying decision that you won’t regret. What are Space Designer 3D pricing details? What integrations are available for Space Designer 3D? If you need more information about Space Designer 3D or you simply have a question let us know what you need and we’ll forward your request directly to the vendor.